Peter de Sève, A New Leaf, 2014. Courtesy and ©Peter de Sève. All rights reserved. Stockbridge, MA, April 5, 2018—As part of its Picturing The Fantastical series, Norman Rockwell Museum will present an evening lecture with illustrator Peter de Sève on Saturday, May 12, from 5 to 7 p.m. An artist celebrated for his work for The New Yorker, picture books, and character designs for such animated films as A Bug’s Life, Finding Nemo, Robots, and the Ice Age series, Peter de Sève has been inspired by masters of fantasy illustration throughout his career—from Edmund Dulac and A.B. Frost to Frank Frazetta and T.S. Sullivant. “I don’t really think of myself as a fantasy artist,” notes de Sève, “but looking over my work I realize almost none of it could actually take place in the real world. So, guilty as charged.” The artist will discuss the work that has spurred his own creative process, as well as projects that have engaged him for decades. The event is free for Museum members, children 18 and under, or with regular Museum admission. Peter de Sève’s illustration and character designs are known throughout the world. 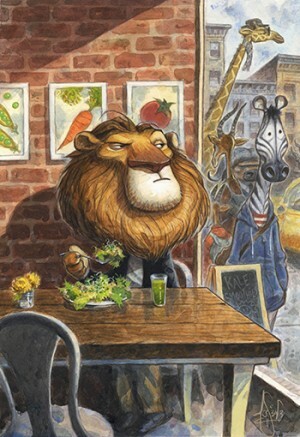 Best recognized for his many New Yorker covers, and character designs for the three blockbuster Ice Age movies, de Sève has also contributed to such films as Mulan, A Bug’s Life, Tarzan, and Finding Nemo. He has also produced illustrations for such books as A Murder, a Mystery, and a Marriage; and The Duchess of Whimsy, created in collaboration with his wife Randall. de Sève’s many distinctions include the Hamilton King Award from the Society of Illustrators, a Clio Award for a Nike television commercial, a Spectrum Annual of Fantastic Art gold medal, and an Emmy Award for Outstanding Character Design for his work on Sesame Street’s Abby Cadabby’s Flying Fairy School. Learn more about the artist’s work at www.peterdeseve.com.